The Manager of the Essex-based paintball range, Mayhem Paintball, has recently insured his trigger finger for no less than £100,000, to ensure that he can continue paintballing for the rest of his life. Ronnie Hollington is not the first person to insure their most important body part – celebrities have been doing it left, right, and centre recently, including Daniel Craig, who has insured his whole body for $9.5 million. The paintball business was started on the Hollington family farm when Ronnie was 7 years old. What started out as a fun side project expanded into one of the largest and most thrilling paintball ranges in the UK. But it was when he left university and started working at Mayhem Paintball full time that Ronnie’s personal paintball career really took off. He played competitively from the young age of 16, and spent much of his time touring around Europe and America playing with his team. They qualified for the National Professional Paintball League (NPPL) pro bracket in America, and were offered £250,000 in 2005 for their spot in this prestigious group. With his trigger finger being such an important asset for both his favourite hobby and his livelihood, insuring his most essential body part was an important step to take to ensure he can continue both his biggest passion in life and his company. “The adrenalin rush when people are shooting back at you and paintballs are hitting the woodwork is amazing. 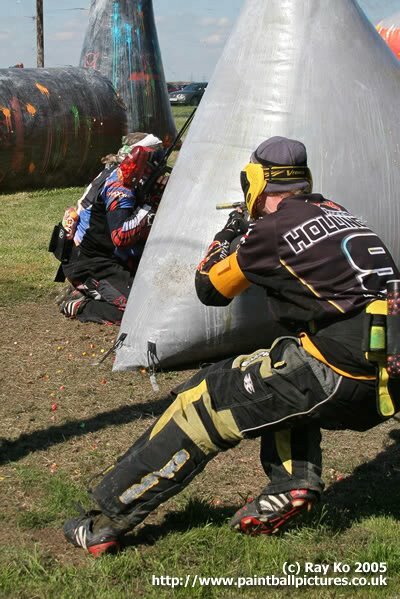 I love team sports, and paintball particularly is one where you need to work together, or you will lose,” said Hollington, when asked what he loves most about playing this increasingly popular sport. Hollington plans to keep playing around the county, for the time being, and is looking out for new, fresh ideas to improve Mayhem Paintball further. At least Hollington can continue playing, assured that his trigger finger is in safe hands. About the company: Mayhem Paintball is situated in Essex and has a variety of themed courses, including a Call of Duty range.